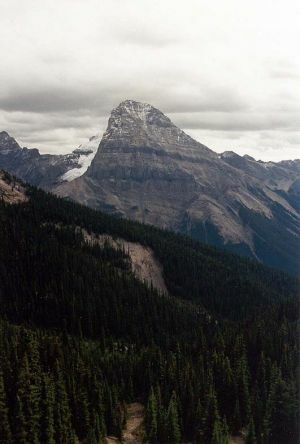 Mount Stephen is a popular mountaineering objective which towers over Field, BC. It has long been a Rocky Mountain icon. Mt. Stephen House, constructed near its base in 1886, was the first hotel in the Rockies. Mt. Stephen has the distinction of being the first Canadian peak over 10,000 feet to be climbed. J. J. McArthur and his assistant T. Riley, both of the Dominion Topographic Survey, made the first ascent, carrying surveying gear, on September 9, 1887. Mary Vaux became the first woman to climb a 10,000er in Canada when she topped Mt. Stephen in July 1900. The peak was named in 1886 for Sir George Stephen, who was made president of the Canadian Pacific Railway in 1881, and thus was in charge during its construction. When Stephen was later knighted and took a peerage, he chose to name himself for the mountain – he became Lord Mount Stephen.